So you've decided to buy someone a gift! Congratulations, you are a generous and beautiful soul. Let us reward you by shouldering some of the burden of gift selection. We have trawled the world of presents, gifts and general treats to find the best gifts for men so you don't have to. To make this nice and easy we've broken the gifts down into categories. We've also separated them based on price. Yeah, it was loads of work, so don't forget to write us a thank-you note when you're basking in the glory of your amazing gift. Our price ranges are sensible too, there are no £1000 presents here instead we've opted for gifts less that £25, £50, £100 and finally £200. We've worked tirelessly to make sure that each of these is something genuinely useful too. So there's no niche nonsense that's exciting on the day you open it, but just clutters up the house after. We've selected products from loads of tech categories, as well as slightly less tech categories - like beauty - which still have some amazing products that will thrill the geek in your life. We've broken all this down into wearables, kitchen, beauty, photography, entertainment and phone and tablet. There are some proper bargains in here too, including some tablets and phones that cost way less than you'd think. 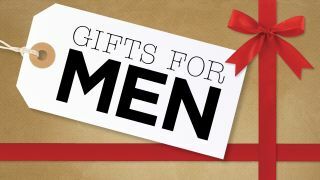 We're focusing here on men, but of course there's plenty of gifts in here that will appeal to anyone in your life. We also have a guide aimed at women, which offers another huge batch of ideas, so use both and you will surely become the master of giving. You might think that £25 doesn't get you much in the world of tech. Well, wrong, because tech is now both affordable and awesome at the same time. From headphones that perform far better than you'd ever imagine, to bargains in DVD and games that will blow your mind. Simple, cheap and they sound great, you can't go wrong with these headphones. Perhaps not beautiful, but a solid purchase. You know that gym membership your gift recipient doesn't use? Well help him get back into shape with these bluetooth earphones. Cheap as chips, nice and discrete and feature Apt-X for the best quality sound over Bluetooth. Big bass, NFC to make Bluetooth pairing a breeze and the option to use Siri on an iPhone too - what more do you need? Oh right, and 8 hours battery. RHA are a British headphone company that makes some great little products, these plucky headphones are a bargain and will deliver solid sound too. Gaming mice can cost a lot of money, so if you're on a budget then the VicTsing is a great option for cut priced killing (virtually speaking, of course). Gaming headsets can get costly - like a lot of gaming kit - so this Plantronics headset is ideal for anyone just starting on their gaming adventure. Microsoft's wireless game controllers have only one problem - batteries. So grab this rechargeable pack that will save you loads in AAs over the years. Anyone with a Playsation will tell you need Plus. You get free games and online play and three months is a fantastic gift for the gamer in your life. If you skip the official Microsoft merchandise then you can nab a real bargain, like this charging cradle with two rechargeable batteries for Xbox controllers. Any photographer will tell you that the Joby is a handy little tripod. It wraps around things, can be used on a table and is small enough for a camera bag. It's not exciting, but anyone who takes photos will love you for more SD card storage. This card is super-fast and has loads of space too. The absolute worst thing about carrying a camera is carrying it. So get the Optech sling and you'll find that process much less arduous. Clip this on your iPhone and you'll be capturing some great angles on your iPhone that the built-in lens just can't do. You'll have a lot of fun with this one. Photographers will love this coffee cup dressed up as a high-end lens. Ideal for the photography nut in your family. Ever scratched a phone screen, or cracked one? It's one of the worst feelings in the world. So protect your iPhone 6S with this awesome and cheap protector. Don't use your t-shirt to clean your phone, grab one of these Pure cleaning kits and enjoy fingerprint free phone use for approximately 3 seconds before your hands mess it all up again. Perhaps the world's simplest idea, a small collapsable stand onto which you can place a phone, tablet or book. Pair with a bluetooth keyboard and get a mini workstation going! This little battery can recharge your phone at least once, perhaps twice, while you're away from power. Ideal for the modern smartphone with its six minute battery life. Hardly beautiful, but the Griffin Survivor is designed to keep your iPhone safe even if you drop it on concrete from the height of one person. For Fitbit owners these fasteners serve two purposes. Firstly, to keep your Fitbit band closed, to prevent loss, and second to make the whole thing colourful and personalised. This little stand works with your Apple watch and its charging cable to keep everything in place by your bed, allowing the watch to act as a little clock and keeping it charged. Activity trackers don't have to be expensive, and Chinese company Xiaomi has sold a million of these smartbands in China. It tracks steps, sleep and lasts a month on a charge. Another sleep and activity tracker. The Misfit can show you your daily progress via LEDs and log calorie intake, steps and the app allows you to keep a photo record of your food. Nice and simple way to measure your heart rate. Connects to a phone, via Bluetooth and can talk to apps like Runkeeper to measure your heart during exercise. Keep your Macbook - or other 13-inch laptop - safe and sound when you travel around. Will keep dust out, and stop it getting scratched. For use mostly in phones that have a microSD socket, this can expand your ability to store photos and videos by a huge amount. Worth every penny. Keeps laptops from overheating by giving them a place to send their heat when on a table. This can stop your laptop from having an artificially short life. A very well-priced webcam which gives you HD video and clear audio thanks to noise-cancelling technology. There's also LED lighting to make you feel like a pro. A simple and inexpensive wireless mouse will make you friends with anyone who receives it. This one comes with a little dongle that plugs into your USB socket to make it work beautifully. HDMI cables shouldn't cost a lot of money, and they're essential to all modern home cinema, gaming and computing gear. Give the gift of connectivity. Any mildly scratched DVDs, CDs or Blu-rays that don't play properly might be fixable with this machine. Just don't ask what happened to Disc Protector 1. Here's a tip, take your CDs, Blu-rays or DVDs out of their cases, pop those in the loft and the discs in this case, you'll save a huge amount of space. If you're having trouble with discs in a games console or Blu-ray player the laser might be dirty, this little tool will clean it. Look, it's a shelf. You're unlikely to win gift-giver of the year for this one, but it's also pretty handy to receive. It's hard to dress this up to be anything but a product that makes strips out of vegetables, but for anyone who cooks this is an awesome gift. Blunt knives are the worst, they'll cause you all sorts of problems and won't produce good results - a knife sharpener is always an ideal gift. Blending takes seconds and products either a sauce for your pasta or a delicious drink for your breakfast. This one blends directly into a cup you can take out with you. Admit it, this is clever as anything and a great kitchen talking point. You may never buy one for yourself, but it's ideal gift fodder. Lunch, contained for whomever you chose to bestow this amazing gift upon. Would be better with Spider-man on the front though. It's a gross generalisation but men usually find cosmetics tedious. Take the hassle out of it buy obtaining this pack of everything for the man in your life. Often overlooked are washbags, but a good one is hard to find. When you do eventually track one down, it will last years and travel the world with you. Keep the facial hair of the one your love in check by presenting the gift of this beard trimmer. It's a lot better than wet shaving and you can keep the stubble. "£25 for moisturising cream?" is the sort of thing a man might say to a woman. So prove him wrong with the gift of expensive face cream. The onward march of toothbrushes continues toward the inevitable end when they take over the world and enslave humankind. In the meantime, here's a clever toothbrush to keep your teeth clean. Here you'll start to find some absolutely amazing collections of DVDs, as well as a tablet from Amazon and some seriously impressive audio gear. Spending a bit more gets you access to some high-quality headphones too, but all without breaking your gift budget. Got an old iPhone speaker with the 30-pin dock? Well this little adaptor turns it into a Bluetooth system for virtually no money. These little beauties sound amazing and come in a range of cool colours. They're comfy too, and fold up nice and small. Ideal for those who need their TV to sound better than it does out of the box. Simple and low-cost the Goodmans gives movies a much-needed boost. As much as 10 hours battery life, along with crisp and clear sound, if you need a Bluetooth speaker this is a massive bargain. Sennheiser always win for us, and these are no different. Again, a sensible price and superb sound and comfort. A low-cost solution that turns any TV with an HDMI socket into a smart TV with access to Netflix, iPlayer and countless other games and apps too. Plug Chromecast into a TV's HDMI port and you can pick up your phone and stream video, photos and even your phone phone screen onto the TV. Almost any speakers with a line-input connection can use the Chromecast Audio and become a online music streamer. Play with your friends. A second controller means two of you can play the football game together and see who's best. Then do it over and over. Are you ready to hear 14-year-olds trash-talk your mum while they kill you in a variety of humiliating ways? Then you're ready for a gaming headset. Football. If you know anything about it then you'll know that FIFA is in some way involved, and that results in this video game. Play online for 12 months with your Xbox 360 or Xbox One. As a bonus, Microsoft gives away free games to keep each month too! Much-loved gaming franchise gets a three-game special edition set for your massive enjoyment. Great series, and a lot of fun. A continuing massive online game that's got hundreds of hours of play time in it. This is the newest version, but also contains the original game. Quite simply one of the best games of all time. Single player is amazing, and online multiplater - on PS4 and Xbox One is excellent. Photography is great, but carrying all the stuff around is a real pain. This bag keeps it all safe and out of the way. Someone you know got a GoPro, well then gift them this amazing accessory pack and they'll return the favour with unflattering video of your nostrils. Film is cool, and it looks great, but it's not easy to share online. If you have someone you know who has old photos, then this makes an ideal gift. Photographers will tell you one thing as a starting tip - get a polariszing filter because it can be a massive help at cutting down reflections and give your photos new depth. Keep your camera safe with this strap that should be miles better, and more comfortable, than the one that came with your camera. With connectors for the new iPhone and USB phones this is a must have battery if you travel away from power. Loads of capacity too, for multiple recharges. Plug this into the wall and you get six USB outputs that can fast charge any USB device. Fast, simple and affordable. Sensibly priced and absolutely brilliant for anyone who wants to work on their Android or Apple tablet when they're out and about instead of a bulky laptop. Ideal for us by children, it's not the best tablet in the world but it will give you most of what you need to keep JR entertained. Makes for some beautiful pictures on your iPhone 5, and there's a new version for the iPhone 6 and 6S too. Nice-looking and capable of monitoring your every step and every snooze too. Comes in a litany of colours too, if that's your thing. Jawbone UP is pretty cool looking, but also does a smashing job of monitoring your calorie intake along with sleep and walking distances. Know someone with an Apple Watch - then help them keep things fresh with this additional band. Looks like a GoPro but isn't, still records 1080p video though, which is ideal for outdoor activities. A nice simple activity tracking watch that can also monitor your heart rate via a chest band, which is super-accurate. Keep your 13-inch Mac or PC very clean and tidy with this rather tasty and ridged sleeve. Have you ever lost loads of great photos or other data because your computer had a boo-boo? Well get this backup drive to keep your files safe. Eugh. Printing. No one likes it, but we all end up having to do it from time-to-time. Grab this HP, then marvel at how it costs more to replace the ink than to buy a new machine. Compact, lightweight and useful for use with a laptop, Logitech's MK365 keyboard and mouse set is superb for making you more productive. Most computers don't come with optical drives any more so this Samsung fills that gap, and allows you to backup files to DVD as well. Who remembers when Blu-ray players were £500? We do. Now they're £50 for a great little device. What a time to be alive. For £50 you could own possibly the best series in the history of TV. Remastered in widescreen and in HD to boot. What are you waiting for? Honestly, it's a toss-up between this show and The Wire for greatness, but The West Wing is must-watch TV. All four of the Jurassic Park movies in one Blu-ray set. Perfect until they release the next movie in the increasingly inaccurately titled trilogy. There are two kinds of people, those who have seen all of Only Fools and those who have not. Don't be the second kind of person. Turn the excitement of eating into the excitement of a science lesson. Learn about flavours and build weird and wonderful dishes. Some trash gets talked about these all-in-one coffee machines, but the truth is that they make great coffee with none of the messing about doing it yourself takes. Guns for show, knives for a pro. Of course guns are next to useless for cooking, but these knives will help you make amazing food. You simply can't make a Creme Brule without a blowtorch. Also you'll be able to offer very small car repairs on the side to fund your kitchen gadgets habit. There's nothing quite like cooking on a BBQ. Sadly, it's also all too easy to mess it up with poor tools, so gift this to your BBQ king or queen and eat perfection outdoors. Shave yourself almost completely clean with the Philips Shaver 3000. It's not quite like wet shaving, but it's a lot less painful. Gifts shouldn't be painful. Someone once said that if you don't use an aftershave then all you smell of is yourself. There's a chance they were being rude. Anyway, this kit has stuff to make you smell good. It's another toothbrush, but this one can improve your gum health in two weeks. So give the gift of healthy gums, if nothing else. At £32 for a cream you smear on your face this one better have some magic embedded with it. Still, makes a great gift for the tired-looking person with bad skin in your life. Help your loved one maintain their hair length to perfecting. This little device will allow you to trim beards to perfection. When you're spending up to £100 there's some really awesome stuff available. Wearables offer some great fitness trackers to keep the one you love healthy, and you can buy a Blu-ray player to wind down in the evenings. A small, but surprisingly powerful speaker that will produce far more sound than its tiny proportions should allow. Plok your iPhone on the built-in dock, or use any phone with Bluetooth. What's more, there's NFC to make pairing a phone dead simple. Ideal for commuting where big headphones are a hassle, these in-ear models isolate you from outside sound and give great sound. The UE Boom offers portable sound with surprising power, even outside. It's water resistant and you can get it in more colours than Joseph's coat. These full-sized, over-ear headphones have built-in batteries and Bluetooth so there's no messy cables. You can get 30 hours of sound per-charge out of them too. Apple's trust box is perfect for people who have music and video stored in iTunes. There's also a bunch of other video services on offer too. A new version of this powerful media player will let you stream Netflix and Amazon Prime Video in up to 4K resolutions. There are also games and apps too. Got a Sky dish you're not using anymore? Hook up this little box and you'll get oodles on free channels, many of them in HD. A subwoofer is included with this soundbar to give the maximum possible range of audio. Clear speech along with deep bass is a real winner. Although not a 4K Blu-ray player, this Panasonic will do some magic to make your Blu-ray movies look great on a 4K TV if you have one. Rainbow Six Siege will be the finest multiplayer game for a long time, so pre-order the game plus extra DLC content in one go for PC, Xbox One or PS4. Gaming on a PC requires a good keyboard and the Asus offers mechanical keys which makes for a wonderful gaming (and typing) experience. Bask in the glory of classic game with this new version of the Sega Megadrive that includes 80 games. For someone with a Canon SLR, this lens is an amazing addition to their gear. Well-priced and produces amazing results. All photographers need a tripod, and this sensibly-priced one offers a lightweight design and small size, perfect for traveling about. It's hard to explain the miracle of SD cards to young people, but for those of us with a few years on the clock, these things are like magic. This one has a LOAD of storage space too. Check this is compatible with your giftee's camera, as it includes a battery. That said, this kit is great value for a new photographer. Anyone will tell you that a camera bag is essential for any photographer. The USA Gear allows you to store loads of kit and carry it with you. For under £100 you can get a great smartphone with 4G support without the need to have any contract. It's a great phone, and sensibly-price too. It charges your smartphone, tablet and pretty much any other USB device and has 10,000mAh capacity. What's more, it can jump start a car too. You've spent a lot of money on an iPad, so why not clad it in something that will do its justice? Apple's official cases do exactly that. If you have an iPad Air 2 then you have a powerful computer on your hands, add a keyboard case and it becomes even more useful. Asus's MeMo pad is powered by an Intel processor and offers a decent-sized screen too, if you need a tablet for kids, this could be ideal. GPS watches are still a rarity in Android Wear and that means a lack of accuracy in activity tracking - for accurate tracking, grab a Garmin! Stunning looking hardware and an amazing app make the Jawbone UP2 a fantastic choice of activity tracker. Wireless sync and 10 days battery are massive bonuses too. One of the cheapest Android Wear watches. A little older now, but still as capable as many new devices. A simple smartwatch, but one of the best-loved ever release. Long battery life and a simple design make it a winner. Withings manages to make some beautiful wearables and other health devices, the Pulse can monitor everything you'd need too. If someone you want to buy a gift for flies, grab this bag for them, it's ideal for taking on planes and tucking away when not needed. Now you can Skype with friends using this epic 1080p webcam. Just make sure you've had enough sleep before appearing on. Or use makeup guys. Own an Apple laptop and miss the optical drive, well you can just buy one to keep up with movies or old backups. Apple's mice are expensive, but well worth it if you're an Apple user, it also makes a great gift because it's a treat. Again, we need to talk about your backups. Make more of them more often - use this drive to do it. This player offers a load of smart functionality and super-fast Wi-Fi so that you can watch video in the best possible quality from the internet. Another amazing TV series for offer in amazing quality thanks to Blu-ray - a fantastic gift. Watch the amazing Soprano family do their thing in this complete boxset, another great one for TV fans with time on their hands. The person you're giving this too will need to be happy with violence and immoral behaviour, but this is one hell of a TV show. Watch Walter White go from a chemistry teacher with cancer to a man with a very different job. It's a lot better than we described it though. Look, there's no way to dress this up, it's £70 for a salt and pepper mill. But, what it does offer is a gift that someone would probably never buy themselves - the best kind, basically. The Nutribullet aims to make you healthy by pounding every last drop of goodness our of fruit and veg. Get in on the juicy action now. This kit gives you everything you need to open a bottle of wine, then seal it up and pretend that it won't all get drunk in one night. An ideal wedding gift that allows you to personalize your chopping board gift that will be cherished forever. Or as long as the marriage lasts. Everyone loves chips, but chips are bad. The Philips fryer does its best to make them as not-bad as possible. So give the gift of chips to someone you love. Everything a man needs to travel is in this bag, which makes it the idea gift for any dude who's shunning his obligation to have silky smooth face skin. It's a bag to put washing stuff in for travel. Honestly, it's a great gift. Go easy on your skin with this grooming station which aims to shave you without the pain of wet shaving, and has everything you need to look great. Smelling clean is nice, but smelling of a fancy fragrance is even better, it's also the go-to gift for men who can't be bothered to buy stuff themselves. All of us men have annoying body hair, so help the man in your life keep his in check with this bodygroomer. From games consoles to arcade controllers for playing games like Mortal Kombat the sub-£200 gift category has everything you could ever need. This is where you'll find cheap - but awesome - phones, as well as surprising deals on great tablets. THE name in nightclubbing also does a range of headphones and speakers. They're decent-sounding too. Sono's cheapest - they would say "best value" - speaker, sounds awesome and can be paired up to make a stereo system. Some of the best headphones you'll hear. Although they're expensive, they compare well to earphones that cost at least twice or three times as much. Bose continues its solid reputation for awesome little speakers with the SoundLink. It looks cool and sounds awesome. For anyone who loves music Spotify remains the best choice. This year-long suibscription will make anyone happy, and existing subscribers can just add to their current term. The current generation of consoles is out of reach for the sub-£200 price range, but the last generation has an awesome selection of games and will give amazing fun. As with the Xbox 360, the PS3 is far from obsolete. Grab this amazing console for a good price and enjoy thousands of great games. Audio-Technica makes some amazing headphones, and unlike some gaming sets these offer high-quality sound too. This Android TV box offers 4K Netflix, Android games as well as current console generation games. Clever stuff happens in the cloud to make this box so capable. Some gaming chairs look ridiculous, this one looks comfortable and cool. Gaming chairs aren't essential, but they are great for long PC sessions. This controller isn't cheap, but it does promise to give hardened gamers far more control, and thus better results. Now pretending you can play the guitar is actually as hard as playing the guitar. On the plus side, the game is a lot of fun too. If you know someone who is good at games, give them one of these and they can stream videos of them playing to YouTube and make millions. Everyone wins. For those who love games like Mortal Kombat, this sort of affair is perfect. It turns your console into an arcade machine in an instant. Chuck this into your gaming setup and transform the sound immediately from lackluster to awesome. Looks great too. The TZ range has, for a long time, been amazing for photographers looking for a great point-and-shoot snapper, this one is no exception. If you know someone who has a love of photography and a Canon SLR, this makes for a great gift. Expensive, but as a gift for a photographer or videographer shooting 4K, this is going to be a huge boost to their tool kit. Suitable for any Nikon DSLR, this lens offers a way to frame all sorts of shots beautifully, but as a portrait lens is where it works best. Amazon's tablets are ideal for anyone who uses Kindle and lives in the Amazon world. The 10-inch size of this one makes it good for younger users too. One of the best tablets ever made. It's not as new as it once was, but it will still get the latest version of Android, and it's a good budget tablet option. The original iPad Mini is still a great little tablet, for light use it's ideal and a great gift for someone new to tablets. The most recent of the Moto Gs offers all manner of features, including 4G and a 13-megapixel camera. A great gift for someone new to smartphones. One of the cleverest tablets, runs on an Intel processor and has Android installed. It looks amazing and offers a great tablet experience with an unusual design. Motorola's round watch offers one of the best aesthetics of any smartwatch, and loads of features too. One of the coolest looking smartwatches about, but also one dedicated to helping you track your activity each day. If you're giving a present to someone who loves running, the Garmin is ideal - it has amazing features along with superb accuracy. One of the most capable smartwatches you can buy, the Sony can track you with GPS which makes it great for runners. TomTom take sports seriously, and with their navigational expertise you can also be sure it knows where you are, and can help you plan runs. Spending more than £100 on a keyboard might sound daft, but this is how you interact with your PC, than this is just about the best keyboard out there. Amazon's amazing Kindle is made even better by the glorious Paperwhite. If you're into reading, but want to save trees this is the device for you. If you know someone who spends a lot of time on a computer then the chances are they need some safe storage, which this NAS offers. This might sound like a snooze fest, but if you've ever used bad Wi-Fi you'll know what a pain it is, this will give you speed and stability as well as advanced setup options. Called a gaming monitor, but really just a good all-rounder. Its gaming name means it responds fast and that appeals to the gamers! Watch Blu-rays while you record Freeview programmes in HD. It's going to kill off loads of other boxes under your TV, and that's a good thing. The smartest Blu-ray player around, looks great, upscales to 4K video and offers smart features a-plenty. Beef up the sound in your home cinema with this amazing soundbar with built-in subwoofers to boost sound and give movies new life. Speakers, Blu-ray player all included. It's an all-in-one cinema package for the person who wants to start enjoying films as they were meant to be seen (and heard). Watch TV shows from your home TV provider while you're on the move on a phone or laptop. It's never popular when you throw out all the food to make room for all the beer, so grab a dedicated fridge. Global knives are must-haves for the kitchen, so why not make them must-haves on the dining table too. Beautiful coffee from a machine, in minutes, without the need to mess around brewing your own. Oxo makes pans now, and towers and also stock cubes. The pans look good though, and any chef will love them as a gift. Magimix blenders will blend you up sauce, juice and smoothies in no time at all. Plus it looks cool as beans. How clean can your teeth get? Well Philips says cleaner than they are right now, and this toothbrush will sort them right out. This is the Rolls Royce of shaving products. Also has a cleaning centre too, so you can keep it pleasant and hair-free for its whole life. Proper shaving is a thing of beauty, so for the man who doesn't want to go electric, grab this as the ideal indulgent present. For the price this will probably kill vampires, make you irresistible to your choice of lover and take the bin out. Or perhaps just make you look 20 minutes younger. How do you smell? Good? Well even if you do you can always smell different.